As most readers are aware, we were away for most of last week, visiting Washington DC. We went primarily to view the exhibition of the works of Hokusai at the Sackler Gallery at the Smithsonian, but we also ended up wandering around to many of the other museums, including the new Museum of the American Indian. We had a great time, and we did eat a lot of really good food; we primarily ate at all of our favorite haunts from when we lived in Columbia, Maryland about four years ago. We ate the superlative Indian food of Akbar, we had king crab rolls to die for at Sushi King, and in Baltimore, we ate crab at The Backfin, and some damned fine kebabs and naan at Kebab Hut in Towson. But somewhere around the fifth day, I found my palate growing weary, and all I wanted to do was come home and cook. That is when I realized how used to cooking for us I had become. It is also, after all of the waiters at our favorite restaurants -remembered us- that I understood how much we had eaten out when we lived in Maryland. For one thing, we both worked long hours there, and I was busy cooking for lots of other people, and for another thing–it was easy. There was so much superlative food around us, that it was no hardship to go out for dinner a couple or three nights a week. And the food at those restaurants was still just as wonderful as we remembered it, but…my palate grew weary of it very quickly. I just wanted a plate of something simple. Some rice and stir fry maybe. Or some pasta. So, that is what I have been doing since I have been back. Cooking, cheerfully, and with great joy, because I know that no matter how far we wander and what wonders we ingest while we are gone–it is the food from my kitchen that calls us home every time. Since I have been back, I have been craving pasta and vegetables something fierce. I get this way at the end of winter, when the season argues with spring over who will have sway over the world. The sun shines and the breezes are warm one day, and the next, the sky is grey and snow spits from pendulous clouds. At times like this, I succumb to the temptation of organic produce from California. I try not to–I try to eat local, but I saw those eggplants and they called to me. With a vengeance, they called, and before I could say, “sustainable,” they were in a plastic bag and in my cart. Oh, well. We are not all perfect. 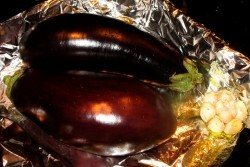 The author stated that the recipe was from Sicily, which is where eggplants first were grown in Italy. They were brought there by the Arabs who controlled that island for centuries, and as I read the recipe, I noted a certain similarity in the ingredients and techniques to the foods of the Middle East.It consisted of the mashed flesh of roasted eggplants, finely chopped walnuts, the mashed yolks of boiled eggs, olive oil, salt and pepper and a quantity of simple Italian tomato sauce. And, I had some homemade marinara sauce in the freezer that I could use for the tomato sauce, so I thought I was good to go. The roasting eggplant and garlic smelled divine–sweet and haunting, with just a tinge of smokiness from the skins of the eggplant. The marinara I already knew was good, because I had made it at the peak of tomato season last year, when the romas were plentiful and filled with the ripe sunwarmed juice and flesh that make the best sauces in the world. I thawed it out and set aside about a cup and a half of it into a bowl to go into the sauce, while I minced up the walnuts which I had previously toasted in the oven. These had a dark golden scent, redolent of the woodlands in autumn. The sauce was simple to put together once the garlic and eggplants were roasted, a process which took about thirty-five minutes. I let them cool, then cut the eggplants in half and scraped the flesh into a bowl, squashing it into a good thick puree by hand with a potato masher. The garlic cloves were similarly treated, though I used the back of a teaspoon to get at them–a potato masher would have been overkill. I noted when I looked at the eggplant and garlic that without the tomato sauce, the color of the dish would be a rather grotesque grey green–not attractive at all, but I hoped that the addition of the brilliant red tomato would not render the end result a muddy brown. The process was simple: I heated up olive oil, and dumped the eggplant and garlic purees together with the walnuts into a saute pan, and stirred to combine them. They bubbled merrily as I let the excess water escape the eggplant pulp. After most of the water was gone, I added the marinara sauce, and stirred it in; the color changed from greenish grey to a dark rose color. With the addition of cream, it became a soft brick red color, and thickened to a wonderfully dense, clingy sauce. I tasted it, and corrected the seasoning with salt and pepper, but found the flavor to still be somewhat flat. Harkening back to the Arabic roots of the dish, and remembering the effect that pomegranate molasses had on my baba ganoush the summer before, I ran to the cupboard, dug out the bottle and added a teaspoon. It was perfect. It added a smoky, tangy zing that finished the sauce and make it soar. 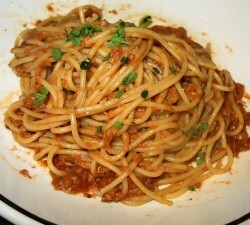 A small amount of the sauce tossed and twirled in with hot, al dente spaghetti was a revelation. Garlicy-rich, and filled with the creamy goodness of eggplant, the dish was both simple and complex. The walnuts added a bit of crunch to it, and their dark flavor supported the eggplant perfectly, while the pomegranate molasses melded with the tomato sauce into a fruity-tangy note that just made me want to weep, because it tasted just like summer. I can’t wait to make this again when eggplants and tomatoes are in season, that is all I have to say! 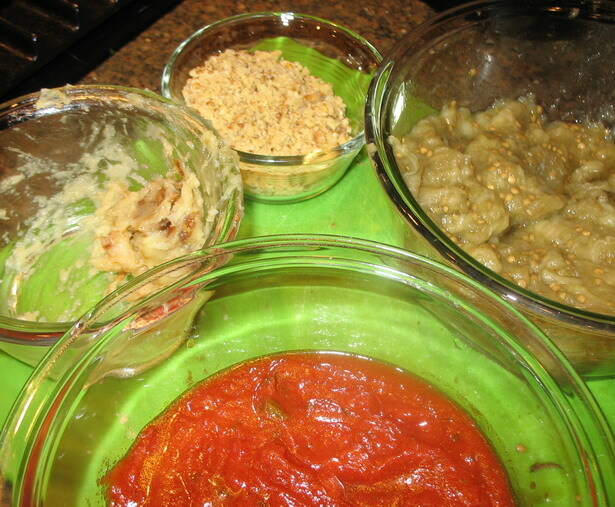 Mix together the eggplant puree with the mashed garlic cloves. Heat olive oil in a saute pan over medium heat and add eggplant mixture. Stirring constantly, allow to start to bubble. Stir in walnuts and continue cooking, until the eggplant dries out somewhat–about four to five minutes. Add marinara sauce, and stir well, and allow to reduce slightly. About a minute. Stir in cream, and pomegranate molasses, then salt and pepper to taste. Toss well with spaghetti–this sauce is very thick and concentrated, so you may need a bit of the pasta cooking water to thin it slightly. There is enough in this recipe to dress about a pound of spaghetti. Sprinkle with fresh herbs as a garnish before serving. Note: Grated cheese does not traditionally go with this dish. I don’t think it would taste right, so I didn’t even think to try it. Serves four for a main course, six for a pasta course. I live in a city with great food (SF Bay Area), yet I get itchy if I go too long without cooking at home. I start to feel like I’m living a “fake” life. Not that my cooking can compare to some of the superlative dining experiences here, but still…it feels good and makes me happy to potter around in the kitchen. Oh. My. God. Does this look good! You are a genius, Barbara. I would never have thought to put eggplant and walnuts together in a marinara sauce. I am definitely going to try this recipe this summer when I have extra eggplants to use. Thanks for the great recipe! Morganna and I couldn’t figure it out, Diane–it wasn’t that my food was simpler than what we were eating, though, in a lot of ways it was less rich, It may have been the richness of the food that got to us after a time. But yes, after a while, it seems as if I am living someone else’s life, 8if I eat out all the time. I love visiting the Bay Area–though I always wish I had a kitchen there, because I do get tired of eating out continually. Besides after the farmer’s markets and Chinatown, I always want to run home and heat up a wok and cook up a storm! Sally–I cannot take credit for the idea of putting the eggplant and the walnuts into the sauce–that goes to the Sicilians. What I did was refine the recipe with roasted garlic, cream and pomegranate molasses! But it is really, really good. 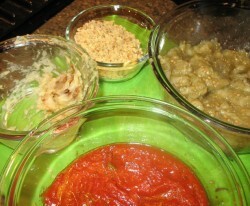 The trick is to mash up the eggplant well into a slightly lumpy puree, and to use 1/2 cup more eggplant than marinara. The tomato sauce cuts the richness of the eggplant and garlic, and colors it prettily. Without the tomato, the sauce would be a ghastly color. The pomegranate molasses wakes up the sauce and gives it a little sparkle and sharpness that really enlivens the whole thing. I think that anyone who loves eggplants will love this dish, I really do. Morganna and I loved it–Zak wouldn’t eat it, even though he loves baba ganoush. So, he had warmed up leftover jambalaya–which wasn’t much of a hardship, according to him, so it was okay…. I can’t wait to try this recipe! I just moved into a new apartment under less than happy circumstances and I haven’t cooked a meal since St. Patty’s day! I think this will be the perfect comforting food to break in my new kitchen. Thanks so much. Ah ha! I figured there must be precedence somewhere for an eggplant and tomato sauce. Not that I’ve really looked mind you. What I’ll do is roast the eggplant and garlic, mix that in a sauce pan with some onion and tomato then put in lots of chopped fresh parsley. Pine nuts and lemon are sometimes added, sometimes there some reduced red wine. The eggplant is my fairly standard way of thinning out the tomato overload of marinara that also helps bulk out the sauce. It also helps me cut down on the pasta which I love but does bad things to my blood sugar. Andy–that is really cool–we almost make the same recipe. The pine nuts stand in for the walnuts–and the lemon and reduced red wine take the place of the pomegranate molasses. How fascinating! That’s awesome. What is funny, is that I thought about subbing pine nuts for the walnuts, but I didn’t have very many pine nuts, so that went out the window….I’ll have to try it sometime. Welcome back!! It’s wonderful when people say they missed your cooking for them. And with your meals, I can see why. Argg! I wasn’t following your blog. Next time you come to this area, do ping me or jon@joss.com. There’s a bunch-o-stuff we’d like to show you. Like the Persian Market (Yekta), the Russian Market, Joe’s Noodle House (Chinese food from the Szechuan side) or A&J (Northern Chinese dim sum) or the frankly weird Indian buffets (beet dishes? turnip dishes?) And the Peruvian Chicken places along with the variations of which one can do with quail (PDT in Columbia vs. Mangos in Laural). Why, thank you, Stephanie–I am glad to be a lift in your day! Turnip dishes, btw, are pretty common in Kashmir, btw. Just so you know. Sounds weird, but there we are. Peruvian chicken! I forgot that I wanted to try that! I am so silly. Joe’s Noodle House–where had I heard about that from? But Northern Chinese dim sum–I am so into that. We’ll be back. Perhaps with an entourage of friends who want to go to the Smithsonian, so I promise to ping you when next we are coming. I’ve never thought of using eggplant in a pasta dish but I will certainly try it now. Every summer I have way too many eggplants and even get tired of ratatouille after several months of fixing it. Linda–another thing to make when you have “too many” eggplants is a baked stuffed eggplant. That is a really nice dish. I usually cut the eggplant in half and then scoop out the innards, leaving about 1/4-1/3″ of meat around the skin. Then, I take the meat and cut it up into cubes or pieces and saute it with onions, garlic, pinenuts and golden raisins in olive oil. Then, I add some ground lamb, some fresh tomato, and some spices and herbs, and when the lamb is browned and happy, I either mix in some already cooked rice pilaf or leave the rice out, and stuff all the goodies back into the shells, drizzle with olive oil, and stick in the oven at about 350-375 degrees for about a half hour or forty-five minutes. If it looks like its getting kind of dry, I cover up the eggplants with foil, and continue baking. The flavorings I use depend on what I feel like. Often they are Turkish or Persian–in that case I will add a bit of cinnamon, some lemon, and maybe some pomegranate molasses. If I do Indian, which would consist of cumin, cardamom, chiles, a dash of cinnamon and clove, coriander, chopped fresh cilantro, sliced almonds instead of the pinenuts, and either ghee or vegetable oil instead of olive oil, I usually will make a cucumber raita or a mango or tomato chutney to go with it. If I do Italian, the herbs reflect that, and I use more tomatoes, and leave out the raisins, and maybe use a few chilies in there just to pep things up. For Italian, I also will use a mixture of ground beef and pork, or use sausage and add a bit of fennel. It is a really versatile dish–you don’t have to use meat, either, just up the amount of rice you use. Give it a shot this summer.